Do you promote your products online? Are you looking for ways to use social media to increase your sales? Both well-known and startup companies are mixing social media and e-commerce to garner more sales. In this article I’ll show you not only how they’re doing it, but how you can do it too. Companies have tried to mesh social media and e-commerce before, most notably in 2012 when everyone from Gap to GameStop to JC Penney ended up shuttering their social media stores. Audiences weren’t ready to buy from Facebook or other platforms. 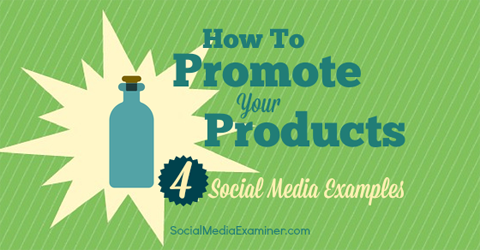 Find 4 examples of how to promote products with social media. Pioneering companies are bringing social e-commerce back by integrating sites like Instagram with websites that look similar to the social sites users are familiar with (e.g., Pinterest). Nordstrom’s Instagram fans (all 530,000 of them) are looking for a quick fix of the latest trends and products. When fans find a product they can’t live without, it’s not uncommon for them to leave a comment asking how and where to buy it. 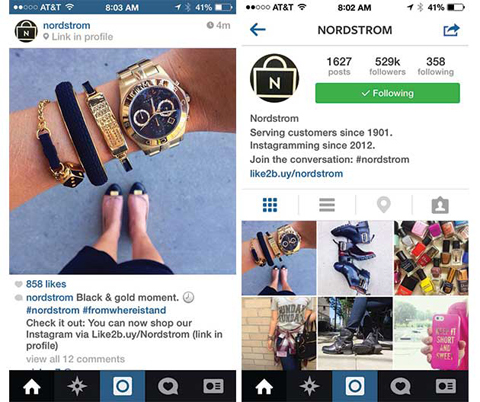 Nordstrom links Instagram with e-commerce and its website. While Nordstrom continues to respond to those comments on Instagram, they’re starting to send people to their new Pinterest-esque site that pulls in their Instagram product photos and links them directly to product pages. Nordstrom created the site with Like2Buy (by Curalate) to partner e-commerce with their significant Instagram engagement. The result is an easier way for fans to buy the products they love right then and there. If you’re ready to invest, you can try out Like2Buy yourself or look at Olapic. Olapic lets you republish user-generated photos within your site in various ways. However, both options are expensive. If you’re looking for a more reasonably priced option, you can start by creating your own Pinterest-themed website for your e-commerce merchandise. There are plenty of templates available and Pinterest user Robin Good has handpicked a few of the best for WordPress. For example, Pinterest is a popular site for sure. The site makes it easy to find new ideas and organize your own. Its feed is filled with attractive pictures and the site is easy to use. In short, people love it. But you may not be making money there. 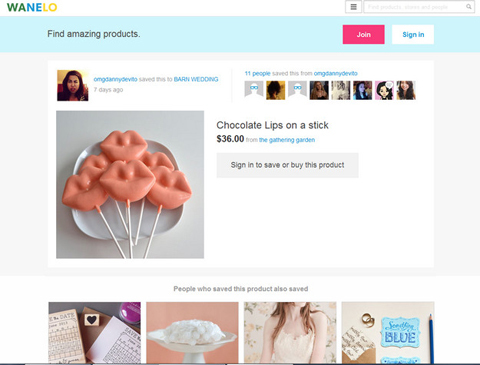 Wanelo uses Pinterest’s easy tagging and collecting with smart e-commerce. Social commerce site Wanelo is addressing that problem. They’ve created a “social shopping site that resembles a well-designed window display.” In other words, it provides the familiar feel of Pinterest. Similar to Pinterest, Wanelo visitors can find items they love, tag them and categorize them into neat little collections. When users browse and eventually buy from a store, that store in turn sends a portion of each sale back to Wanelo. There are plenty of photography collage-style themes out there that let you create individual galleries. You can use them to mix and match various products to create a whole set and link to your e-commerce shop. The popular Sentinell theme allows for the same type of gallery function, but also holds YouTube and Vimeo clips if you’d like to incorporate video. Like the Wanelos and Polyvores out there, Fancy lets users find, collect and buy items from various companies. To set itself apart, it also offers a monthly box subscription (Fancy Boxes) that delivers gourmet food. So where does the social element come in? 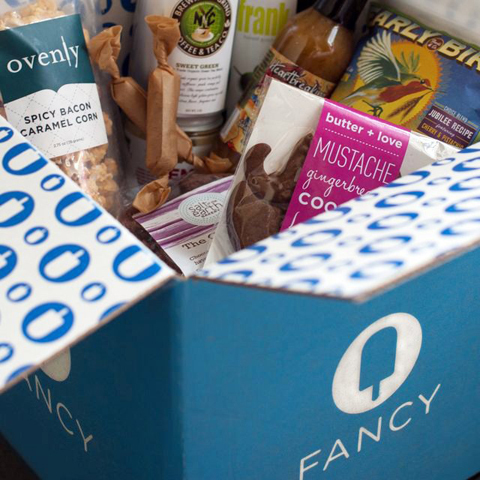 Fancy’s 2 million+ members help curate (via voting) the foods that show up in each month’s box. Fancy asks subscribers for input on each month’s box contents. Encouraging this kind of customer input further reinforces that Fancy truly cares about customers and values their feedback. It’s a great way to build brand loyalty and turn a profit at the same time. The logistics of setting up a subscription goodie delivery service are far too involved to cover in just one article, but you can still benefit from the curation aspect. Use your website and social media profiles to ask customers what they’d like to see in next month’s box. The Ultimate Modern Magazine theme for WordPress lets you curate and spotlight those products and allows users to review and rate products. Of course, if you’d rather, you can advertise your products on a curation site and take advantage of their technology and traffic! 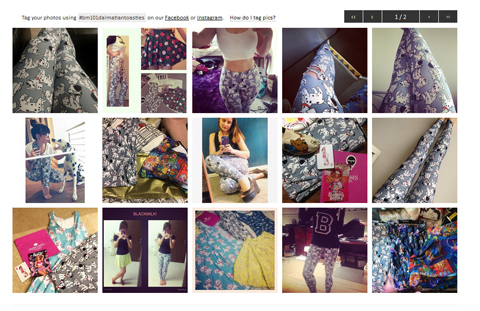 BlackMilk, a company dedicated to making women’s leggings more than just a fashion accessory, asks customers to take pictures of themselves wearing the products and tag the pictures when they share them to Instagram or Facebook. The company figures if you’re going to take a selfie wearing their products, why not share it with other customers? The site even includes instructions on how to tag the photos using Facebook and Instagram. Invite customers to share pictures of themselves using your product for added social proof. BlackMilk pulls the hashtagged pictures into their product pages so other customers can see how the clothing fits and looks on others—and see how fun it is to wear. Bringing social proof to product pages is one more way to encourage visitors to buy. To give product pages this look-book functionality, BlackMilk uses the Show. See. Sold add-on that works with the Shopify platform. The add-on lets users zoom, rotate, spin and filter products to see exactly what they want, as well as buy directly. BlackMilk has a lot of enviable functionality that other e-commerce stores would be wise to notice and possibly implement. To add this kind of tech to your own site, there are plenty of Instagram plugins for WordPress (and stand-alone sites) that will show your tagged photos, as well as other users’ photos, in the sidebar of your website. You already have people shopping your site, finding your products on Instagram and hashtagging pictures of themselves using or wearing your products. Take advantage of that social interaction and make it easier for people to buy in the moment. Recreating a familiar, Pinterest-like site with similar intuitive navigation makes visitors feel at ease. Pulling in your Instagram product feed and linking it directly to product pages makes it easier for fans and customers to buy on the spot—without having to click away to search for the product, click to the site and buy the product. Expect to see even greater interactivity as sites begin to fully explore what’s possible when websites, social media and e-commerce collide. What do you think? Have you tried integrating social media with your website for more e-commerce? What tools do you use? Share your thoughts below! Gary Victory is a business analyst at Elite Group Marketing, a thriving digital agency based in London. He provides meticulous online marketing solutions to a range of private, public and multinational companies.